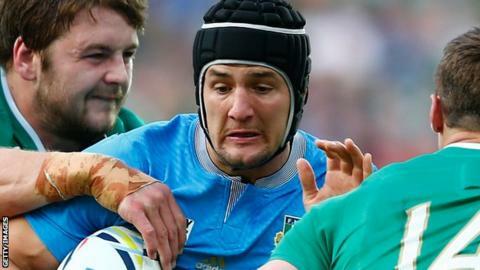 Italy centre Michele Campagnaro will have to wait to make his Exeter debut. The 22-year-old joined up with his new teammates after the World Cup, but has yet to feature for the Chiefs. "We have won two games out of three in the Premiership and he's not been here very long," Baxter told BBC Sport. "He, like a number of other very good players here at Exeter, will have to be patient and when their chance comes they'll have to play very well if they want to stay in the team." Campagnaro, who has won 18 caps for his country and featured in all four of their games at this year's World Cup, agreed a move to the Chiefs in Janaury from Pro12 side Benetton Treviso. He has been training with the Premiership club for the past three weeks. "It's hard for me to say how far away he is, we don't know what injuries are going to happen, we don't know the form of the team, we don't know how our centres are going to play this weekend," added Baxter. "He could be very close or he could have to be patient for a while, but the A League's not more than two or three weeks away now. "All the players that haven't played so far will feature in the A League. That will give them an opportunity to play. They may well get an opportunity before then depending on other circumstances."